This long-awaited open space—the culmination of a series of transformative public projects spanning the past decade—sets the stage for future development and investment in downtown Quincy. Years of planning by the Quincy Planning Department, the Mayor’s Office, and the design team resulted in a visionary plan to reroute traffic around the city center in order to create an attractive and welcoming new civic common featuring a tree-lined pedestrian promenade, green space, and granite plaza, which links together three of downtown Quincy’s most iconic historical landmarks: Old City Hall, Hancock Cemetery, and the United First Parish Church. 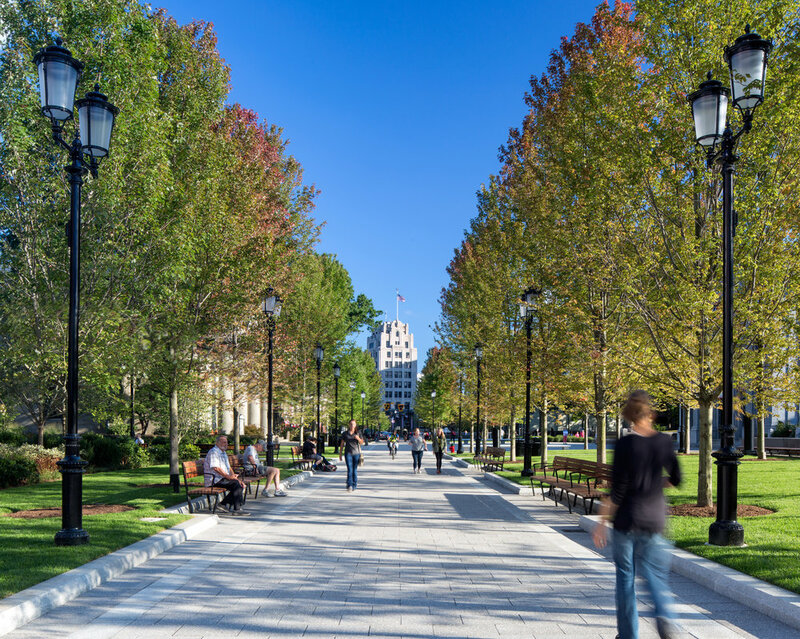 Serving as the new “front yard” for downtown Quincy, Hancock Adams Common creates a seamless pedestrian experience, directly connecting the Quincy Center MBTA station with historic landmarks, public facilities, local businesses, and multifamily residential developments. 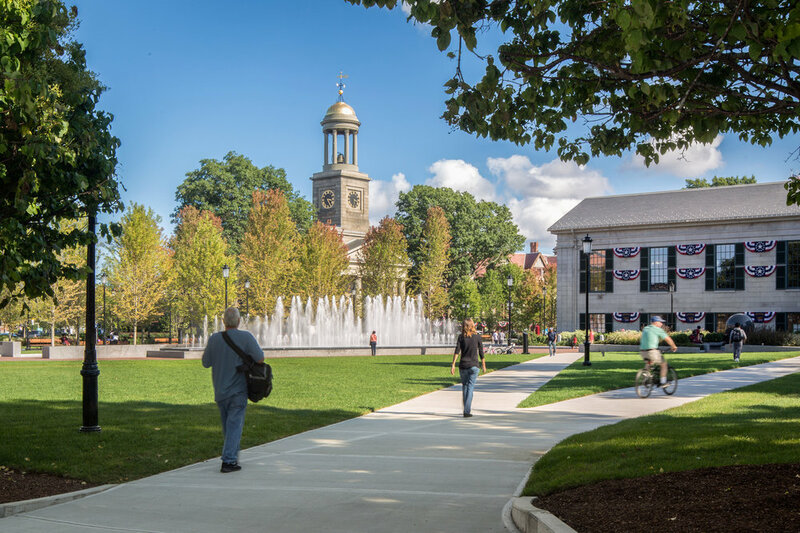 A vibrant destination in its own right, the three-acre Common offers flexibility for a range of programming opportunities and features two fountains, interpretive design elements and sculptures, ornamental plantings, large lawn areas and hardscape plaza spaces suitable for hosting public events. The Commons’ monumental 2,500-square-foot “tidal” fountain serves as a major draw, with its granite surface that recalls the city’s 26 miles of coastal shoreline and more than 200 jets, which are able to spray recirculating water up to 12’ in the air. In addition to honoring the past, Hancock Adams Common firmly plants itself in the present day and future of the city. This multi-phased, multi-effort park project and associated streetscape significantly improves circulation, incorporating bike lanes, raised crosswalks with high-intensity activated crosswalk beacons, elevated tree planters, and other components demonstrating complete streets concepts.